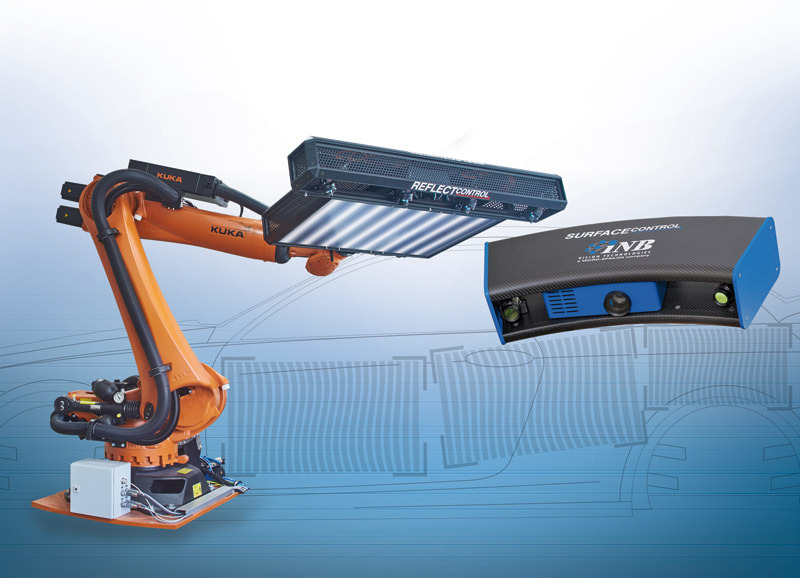 The reflectCONTROL Automotive and surfaceCONTROL Robotic inspection systems provide easy, fast and reliable quality inspection of surfaces. From a complete chassis to a single painted part, smallest defects can be reliably recognized inline, enabling 100% automated control. Well-known global companies such as Daimler, BMW, Honda and Magna Steyr rely on high-tech solutions from Micro-Epsilon in the field of automated surface control for the automotive industry. The robot-supported reflectCONTROL Automotive system based on deflectometry is used for defect detection on shiny surfaces enabling flexible adaption of the measurement processes to different vehicle shapes. The system is integrated into the processing line. Micro-Epsilon provides experienced advice and guidance when it comes to installations in Greenfield and Brownfield plants. Resolutions in the range of tenths of a millimeter enable the detection of almost all defects in the base paint and top coat in a three-dimensional form and position on the bodywork surface. The surfaceCONTROL Robotic inspection system from INB Vision, a subsidiary of Micro-Epsilon, relies on 3D sensors in order to detect mat surfaces quickly and reliably in three dimensions. In addition to the automotive industry, these tasks are present in aviation, domestic appliances and entertainment devices. These new sensors operate on the basis of fringe projection and are available for measurement areas of 290 x 210mm² to 570 x 430mm². The sensors detect a surface within typ. 0.5s per measurement area. The achievable, lateral resolution is between 0.25mm for the smallest area and 0.5mm for the largest one. Therefore, surface deviations from 5µm in height can be detected reliably. The depth of the measurement area of between 150mm and 300mm also enables the reliable detection of zones with a strong curvature. Using planning software based on CAD data, larger test objects are separated into several measuring positions which are approached one after another. The system is designed in such a way that several robots can operate in one cell on the same test object in order to adapt inspection times to suit production cycle time. Both systems - surfaceCONTROL and reflectCONTROL Automotive - cover the automated surface inspection process of the entire production chain in vehicle build from the press plant and the chassis manufacture to EPD coating and painting.